The Mint Bunny: Is dairy really THAT bad? Is dairy really THAT bad? When it comes to knowing how good or bad certain food groups are, dairy can be the most confusing due to a mix of conflicting reports as well as a general lack of unbiased information. We've all been taught that milk is good for us, right? We should be making sure that kids today get a healthy dose of milk so that they grow up strong. It's natural; it's what we've always consumed, and it's what we should continue to consume. Cheese is a great source of calcium, so we should feel okay about eating some good quality cheese. Yogurt has a whole list of nutrients, so it's for-sure safe. Butter is essential for most baked goods and adds the perfect richness to sauces that you can't get from anything else, right? How can you go wrong with dairy? As you've probably guessed by now, there is very little truth to the previous statements. Sure, most dairy products are high in calcium and protein, but the negative contributions (health, convenience, and ethic-related...to name a few) that come with consuming dairy far outweigh the common belief that dairy is good for us. Let's start first with some health reasons against dairy. Did you know that 65% (conservatively speaking, as many reports state 75%) of the adult population is lactose intolerant?!? This statistic should be pretty shocking to read, since it's saying that (at least) two-thirds of the adult population cannot properly digest lactose, and instead, experience asthma, acne, headaches, fatigue, and a whole list of digestive problems anytime they attempt to eat dairy. As infants, we produce an enzyme called lactase, which breaks down the milk sugar lactose; but after we no longer need breast milk, our bodies produce less and less of this enzyme. So why are we fighting these physical cues rather than listening to our bodies? Maybe we're too focused on keeping our bones strong? The statement that "milk produces strong bones" was ingrained in all of us growing up, but today more and more doctors and reliable sources firmly believe that the opposite is actually the case. Studies are showing that the more milk you consume in a day, the higher risk you have for developing bone fractures as well as getting osteoporosis. Professor T. Colin Campbell states that "the association between the intake of animal protein and fracture rates appears to be as strong as that between cigarette smoking and lung cancer." "Okay, I get it. Dairy isn't something our bodies were meant to handle, but if I stop consuming milk and cheese, how do I get enough calcium"? Look no further than broccoli, Brussels sprouts, mustard greens, tofu, squash, chickpeas, collard greens, oats, soy beans...and the list goes on and on. 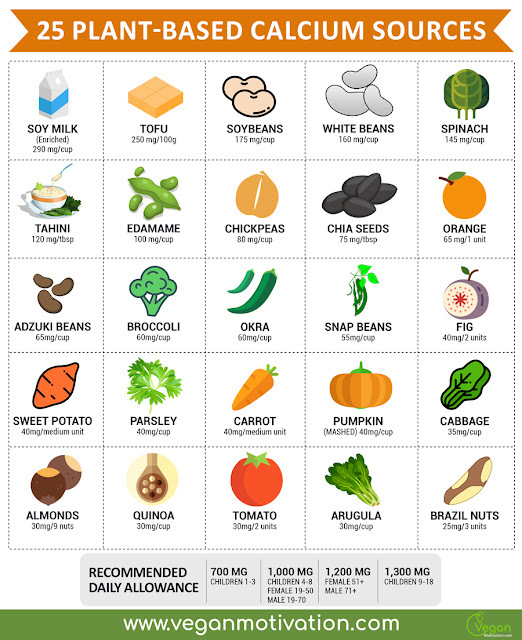 And the best part is that almost all of these alternatives have higher absorption rates than milk! If you're looking purely at milk, you can essentially trade a cup of cow's milk for a cup of plant-based milk, and get the same amount of calcium. The beauty of living plant-based though, is that we can think out of the standard ideology that calcium comes only from milk, and rather look at calcium-rich vegetables, beans, nuts, etc. "Okay...so dairy isn't good for your health, and I see that there are plenty of ways to get my calcium through plants, but real dairy food tastes SO good and there are no replacements out there. Now what?" Luckily for us in 2018, plant-based replacements for dairy alternatives have never been more plentiful. There's almond/soy/cashew/flax/oat/coconut/rice/hemp milk to replace cow's milk. There's non-dairy yogurts made out of these milks that are widely available. Developments with plant-based cheese has come a long ways, and is not showing any signs of slowing down. [Side note: We already have a post on homemade cheese dip, and we're in the process of creating our own recipe for mozzarella cheese, so stay tuned]! Vegan ice cream can be found in almost any grocery store, and taste just as good, if not better, than standard ice cream. Even eggnog is available for vegans during the holidays, and it's delicious! Vegan dairy replacements are everywhere, and are becoming the new "norm" sooner than many of us probably thought. It all comes down to supply and demand, so the less dairy we consume and the more plant-based dairy we buy, the more vegan options will be available for us. And this brings us to the third topic we wanted to cover: the ethics of the dairy industry. 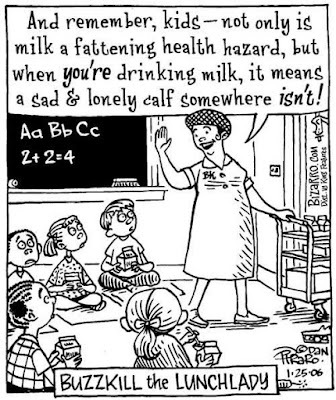 Despite the fact that this might be the strongest case against dairy, it's a topic that most of us know nothing about. To most of us, dairy cows are animals who live happy lives and constantly produce milk...solely because that's what they do; but this couldn't be further from the truth. For a general look into the life of the dairy cow, please watch the following video. Many of us were never taught what really happens in the dairy industry, so we blindly consume their products. We drink a glass of milk or eat a few slices of cheese, notice that the world doesn't end, and continue to drink and eat until we're full. We consume dairy because "it tastes good" and can even be addictive (yup, we're looking at you, cheese), but we don't educate ourselves on what went into that glass of milk or brick of cheese. We are so detached from what goes into our foods, that we don't correlate or include any ounce of emotion. It's time to educate ourselves on the truth, and then make decisions on what we eat once we know the full picture. 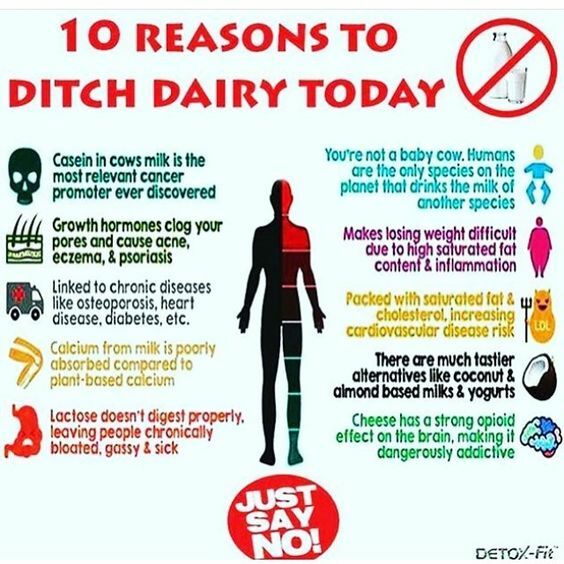 It's time we admit that dairy should no longer be a choice, purely based off of the common argument that it tastes too good to give up. As long as the dairy industry exists, we're telling the world that no animal's life is greater than our taste buds; but life—regardless of the species—should always be priority.